Brie Larson portrays Carol Danvers, a test pilot who works under a Dr. Wendy Lawson. 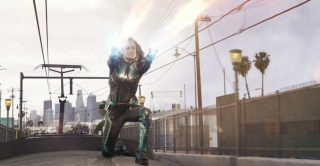 When the pair are shot down testing an experimental engine by the Kree, Lawson reveals herself as a renegade Kree named Mar-Vell, who has been working against her government to assist refugee Skrulls. 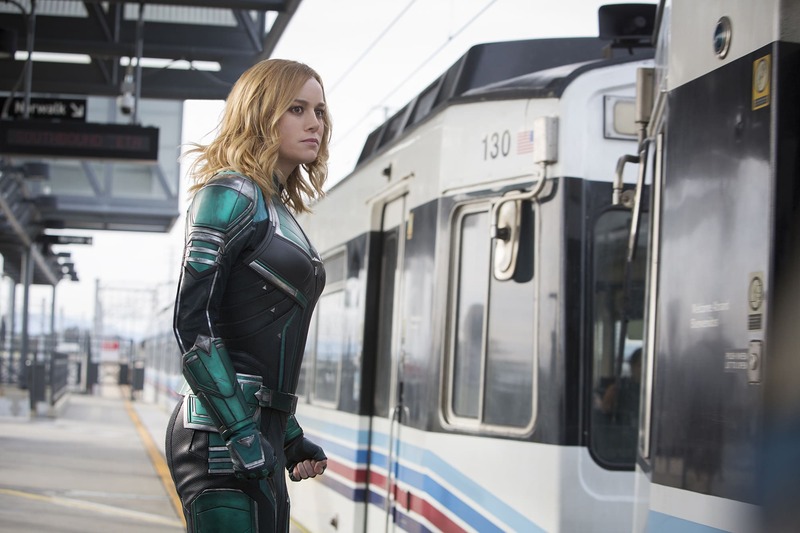 Directed by Anna Boden and Ryan Fleck, Captain Marvel has been a huge international hit. Here is part 2 of our coverage. The film had many visual effects contributors, including, ILM, Trixter, Digital Domain, Framestore, Animal Logic, Scanline, Luma Pictures, Screen Scene, Rise, and others. We are going to highlight some of their work in this second look at the Marvel-lous VFX in the 21st film in the Marvel Cinematic Universe. The Marvel studio VFX supervisors were Chris Townsend and Janelle Croshaw. 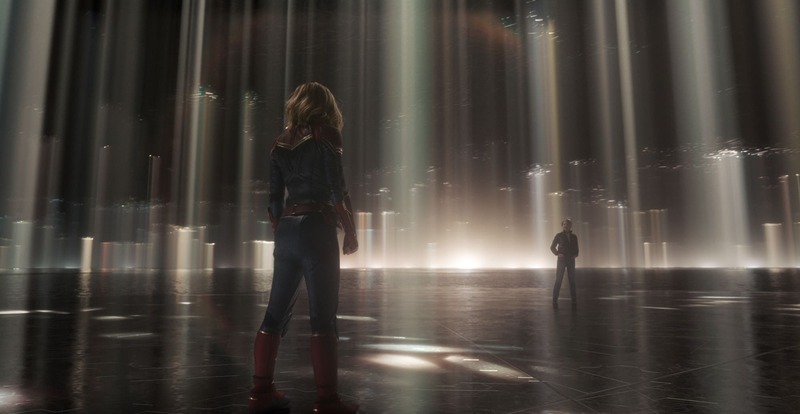 ILM was brought in to help with Captain Marvel/Carol Danver's ‘Binary' super hero powers. After the Kree kill Mar-Vell, Danvers destroys the test engine, but incidentally absorbs its powerful energy-manipulation abilities. ILM built on work done by Trixter, who were also a key VFX contributor. The lead Visual Effects Supervisor at ILM was Craig Hammack. 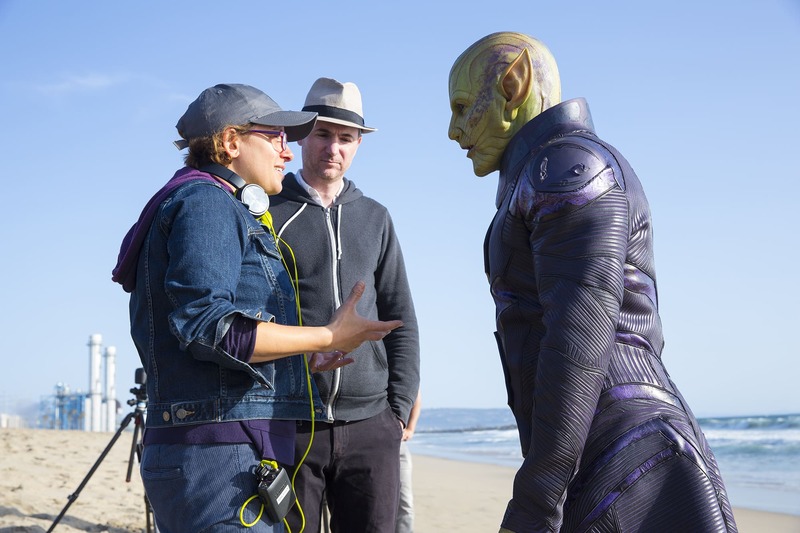 Beyond their work on the Binary powers, ILM also contributed to various other effects on Captain Marvel, such as helping develop the energy effect and producing a detailed digital double of Captain Marvel. ILM's work built on and dovetailed with the work Trixter had started on the Binary effect. Much of ILM's work was in the third act of the film. 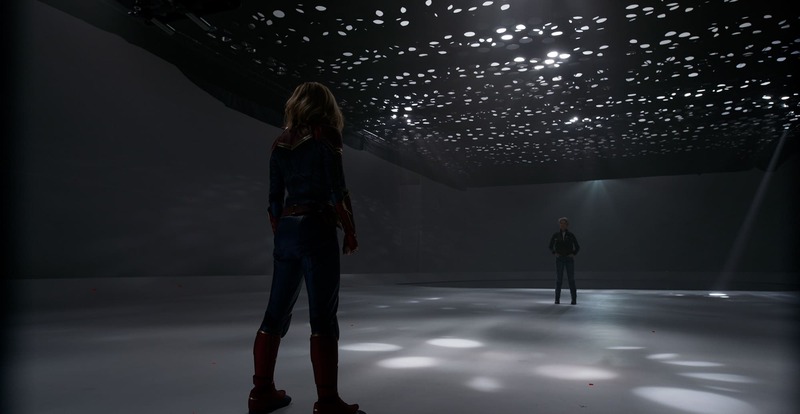 So not only did this involve Captain Marvel and her various fights, in and out of the spaceships, but ILM also handled the building of the ships, the missile attack on earth and the re-entry sequence. The ILM effect was all done in 3D with complex Houdini simulations that were designed to mimic gravitational fields or perhaps magnetic fields. These fields drive energy bolts or a kind of plasma. 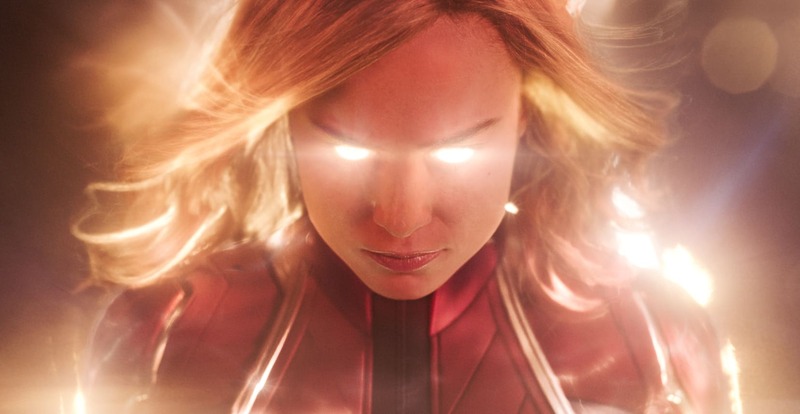 The look involved a complex particle simulation that build a kind of aura around Captain Marvel. "Those various layers of dissolve away from around her and then come back in other areas. It's all 3D simulation work based on matching her very closely,” Hammack explains. 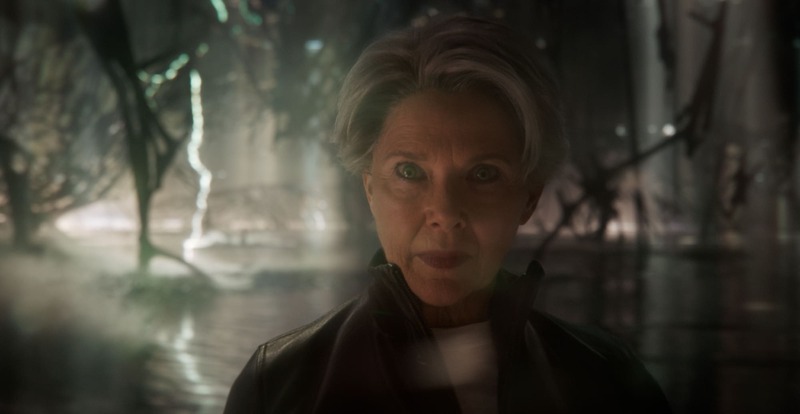 “We also knew that, with all this intense dynamic lighting, that we would have to replace her suit quite a bit.” Unlike prior films, ILM was not required to do much face work and didn’t do any Medusa scans or complex facial rigging. There was some facial replacement, and for those shots ILM just did a more standard photogrammetry based mesh generation. 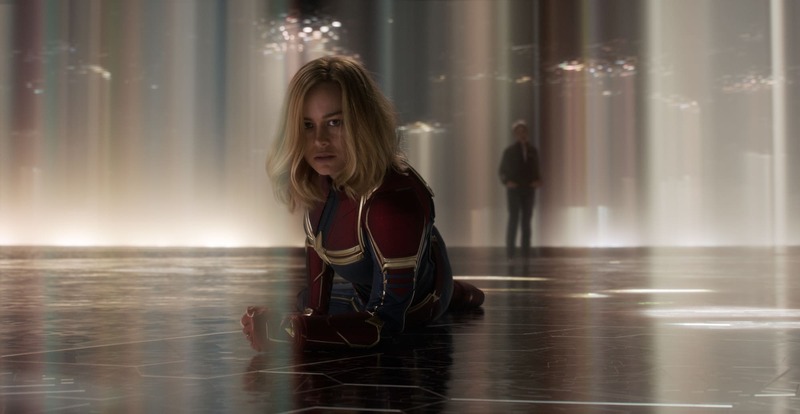 Brie Larson wore LED wrist bands for many shots on set to provide contact lighting, which was then further enhanced and used as reference on to the digital sets. The rendering was done primarily in RenderMan, with some Mantra rendering of the Binary effects. ILM did many of the spaceships and while these were creative projects, they had a tight brief. ILM also did parts of the Supreme Intelligence interior and the interface to access AI Supreme Intelligence. 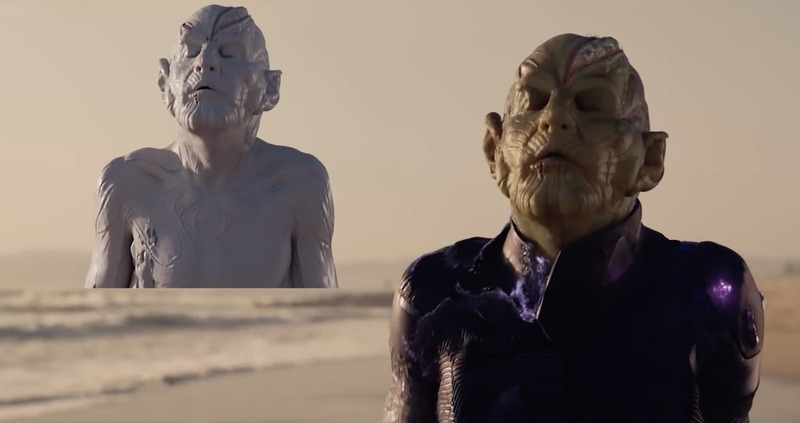 Unlike Captain Marvel's iconic look, in the comics the Supreme Intelligence had many forms, none relevant to the MCU, allowing the film’s designers to have a much wider brief. 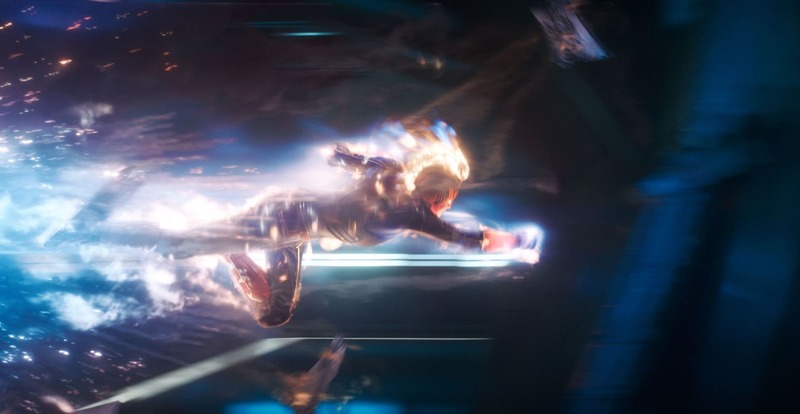 ILM developed the interface seen in the third act restricting Captain Marvel and the ferrous liquid aspects inside. "Chris Townsend had some idea of what he wanted and they had some reference and ferrous fluid that they wanted it to relate back to somehow, but the directors wanted violent and very large… so it was a bit like, ‘something like this, but we don’t like this’,” recalls Hammack, who really enjoyed the creative process of exploring various options to find the solution that told the story, with the right sense of both angry power and technology. In addition to ILM, Animal Logic (AL) in Sydney was brought in to work on the scenes inside the artificial world. This was partially done as they had carried out extensive work on the last Guardians film with the fractal home of Ego. (see our story here). 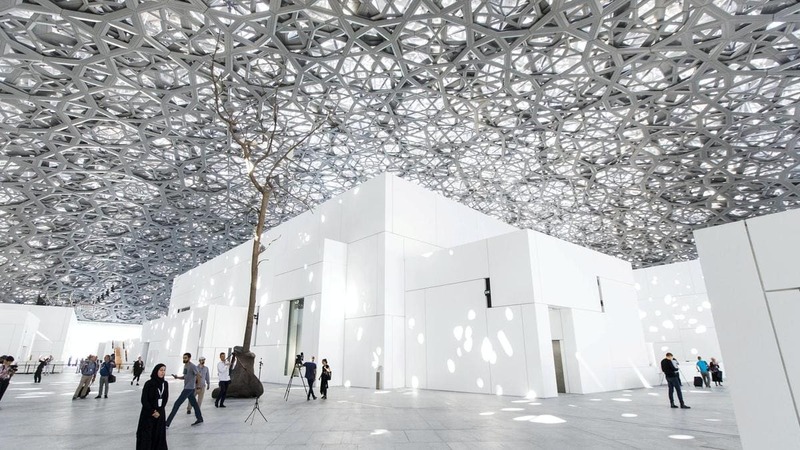 The initial reference for interior of the Supreme Intelligence was the new Louvre Museum ceiling in Abu Dhabi (see above). But in the final shots, the 'ceiling' was less featured and much more a device to motivate light than a detailed structure (see below). Jason Bath, VFX Producer at AL, explains the complex ceiling was still made because, “the feeling wasn't that they didn't want it, but that they did not want to feature it. So it really was used to create the light beams, but if you are looking for it, there's hints of it up there," he jokingly remarks. 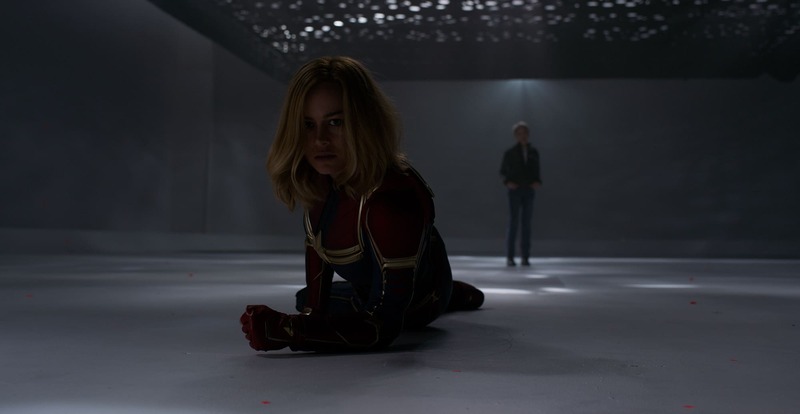 AL worked with footage of Annette Benning and Brie Larson shot on a neutral white stage with some mottled light, but no green or blue screen. This meant that the two lead actors had to be rotoed off the background. To get the quality of edges on both of the actresses’ hair, the AL team built CG hair for both women. This was then added at the sides of the heads, so wisps of hair would not be lost doing the composite. 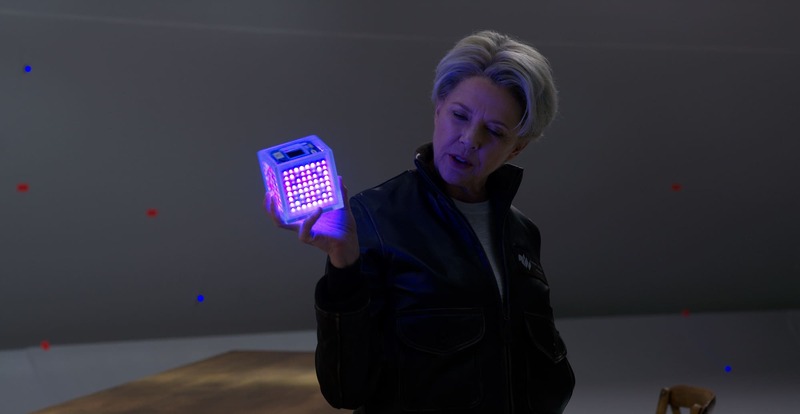 Much like the LED arm bands Brie Larson wore during the fight sequence mentioned above, Annette Benning had a LED practical to simulate the Tesseract. 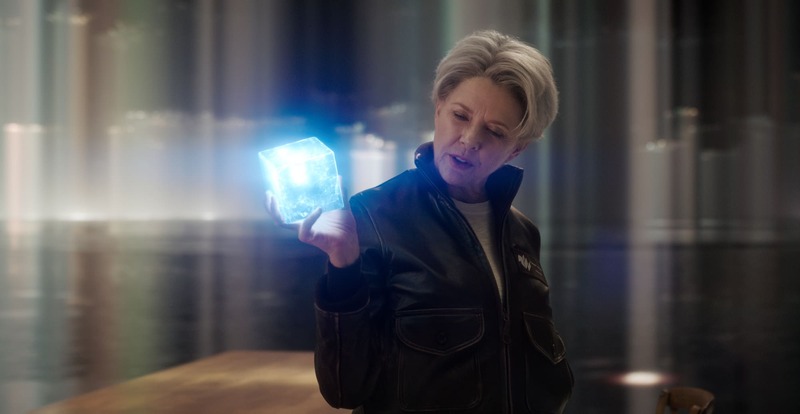 The LED cube was replaced with the CG crystalline cube-shaped containment vessel for the Space Stone. Note how the LED version was shot with a much stronger purple glow that was adjusted in post. AL had to do suit replacement or enhancements for sections of Captain Marvel's suit. 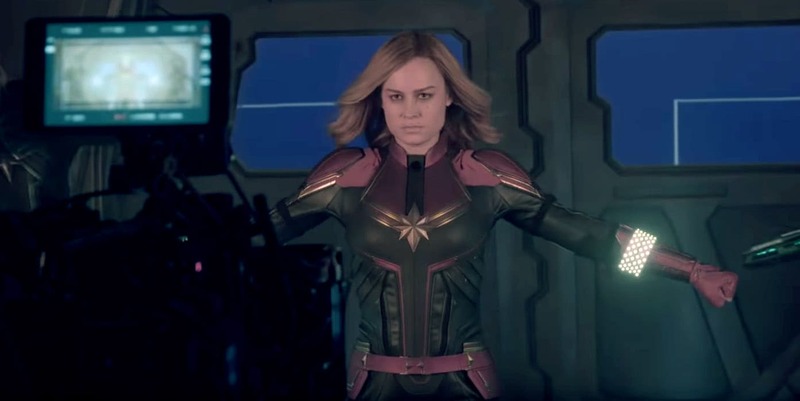 And when Captain Marvel is thrown into the 'mercury wall’, Brie Larson is a full CG digital double with a face replacement. 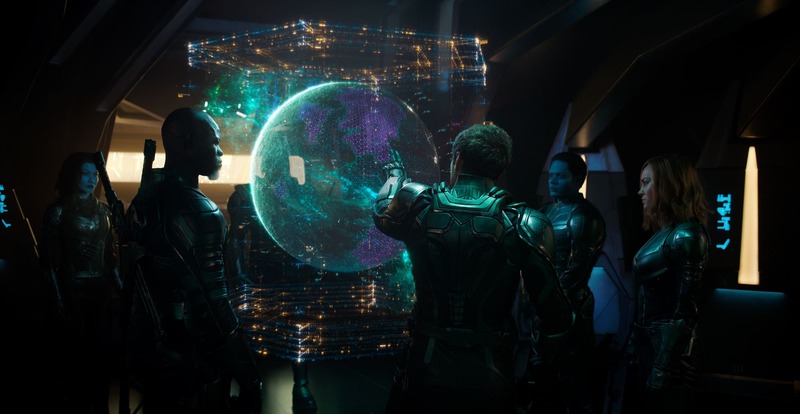 Animal Logic did the hologram scene in the first act, where Jude Law's character explains the extraction plan to his team. AL are now very efficient at doing holograms while all their other work was rendered in their in-house render Glimpse, the team rendered the Holograms in Houdini's Mantra. "The great thing about this particular sequence is the team did a lot of post-vis before they actually turned over the shots to us, which was a great difference to some past projects where the film makers were less clear about what they wanted", explained Butterworth. Animal Logic also did the memory montage sequence that linked the various memories of Carol Danvers. While the optical effects and transitions were less complex, AL did 150 shots for the memory montages, which is also how many they did for the Supreme Intelligence sequence, plus about 15 holograms additional shots, making it 315 shots in total. Most of the Goose cat shots were supervised by Chris Townsend, as the senior studio supervisor. Trixter did the majority of the cat shots where Goose was required to do very specific acting beats or impossible things, such as floating in zero gravity. This work then dovetailed with ILM on the Flerken/Goose shots. ILM handled all the major deadly, secretly tentacled, alien Flerken shots in the third act, except the final post credit sequence, which was done by Trixter (the 'fur-ball' desk sequence). Trixter is one of Germany’s leading VFX studios and, as of August 2018, Trxiter became a partner and then a part of Cinesite. They are a long time Marvel VFX contributors. Trixter also worked out the initial visual ideas for the Binary effects. 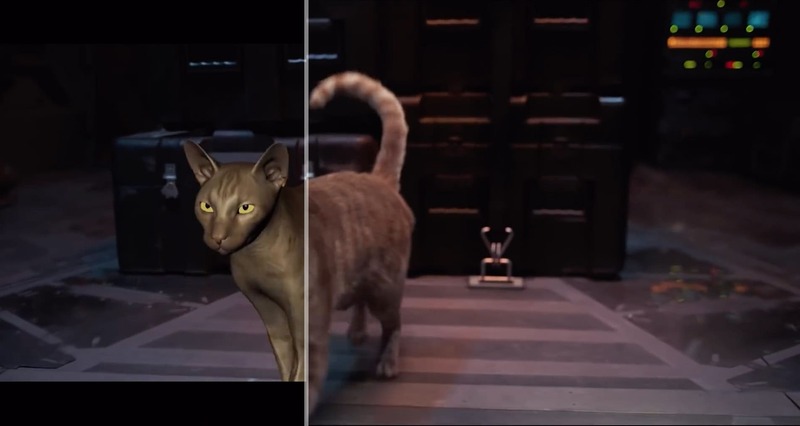 ILM's Craig Hammack delivered the Flerken reveal shots for Goose, where the true, alien nature of Goose is revealed. "Early on the shots get turned over to you and you spend the first half an hour trying to wrap your head around some kind of logic you can use and then you just have to throw logic out,” comments Hammack. "As everyone else piles on the logic problems, you get to a point where you just have to go with it.” ILM's team had to make the giant Flerken look like it was apart of and from Goose. "There's no working around the fact that it's going to break tremendous amounts of laws of physics, conservation of mass, volume conservation and the very elasticity of skin - everything at some point is absurd.” The team decided that Flerken contained a portal to another dimension, "in the throat of the cat and this monster is in another dimension. And it's like, alright, well then absolutely everything is valid!" he adds. Nick Fury was the main character who held Goose. On set for shots where the cat would be replaced, Samuel L Jackson would be given a 'stuffy' that was a representation of the cat, but made of rabbit fur. 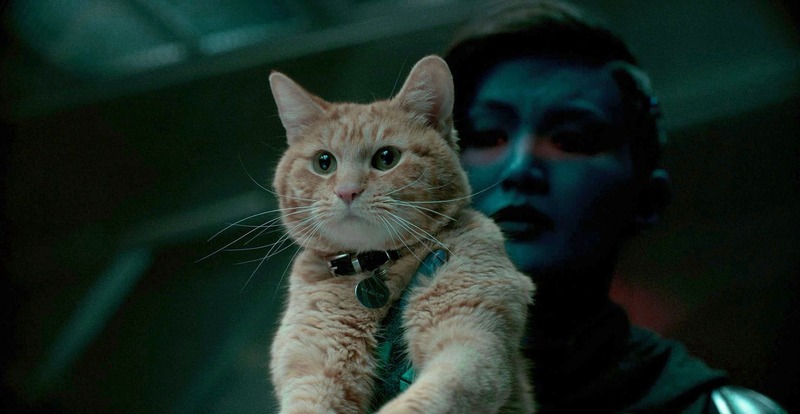 While this was a good representation, sometimes when filming the scene, Jackson would mime the cat’s movement as it attacked as the Flerken. "In some cases, Sam Jackson would be vibrating the stuffy with his hands, to simulate the force of it. And of course it always ends up at a frequency that doesn't really lend itself to the final animated cat. So in most cases we ended up having to replace Sam Jackson’s hands and sometimes his forearms. It just kind of snowballed from there,” joked Hammack. There were four cats on set, Reggie, Archie, Rizzo and Gonzo, and of these Reggie, was the one that seemed to most easily work with the cast, becoming the 'hero' cat look for Goose. Ursula Brauner, of Boone’s Animals for Hollywood, was the cat wrangler for the film. She commented to Vulture, “We always work cats in teams so we can spread the work on different days. They each have strengths. Reggie was good at almost everything. He probably featured 70% of the time as the live cat in the film. If Reggie had a big day or a big scene, we would switch him out for another one after that to give him some rest. Some of the holding scenes, Gonzo was great being held in arms, so we used him for that. Archie is the spunky cat with personality. Rizzo we trained to be the master of all trades, and we would save Reggie for the big scenes.” One of the tasks that fell to the VFX team was to make all four cats identical on screen. While they look the same when viewed separately, they each are distinctively different and thus there was CG work to align the 4 cats to one 'hero' fur pattern. 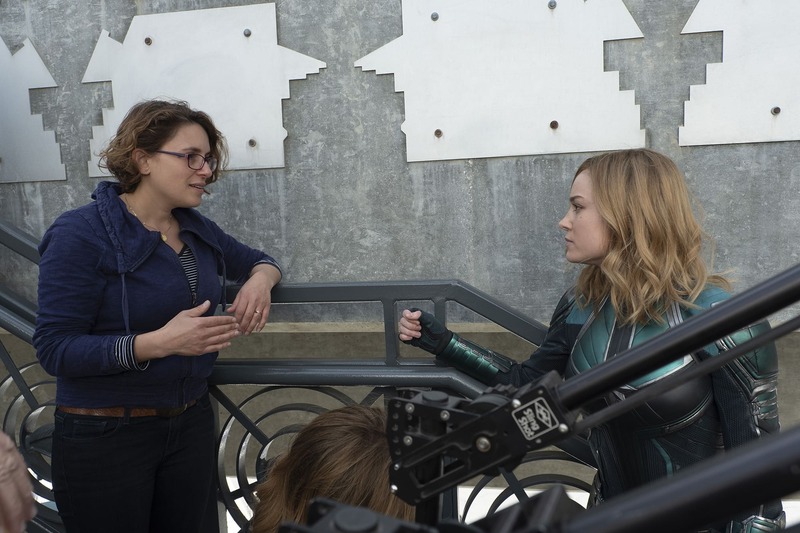 Janelle Croshaw, as we posted in part 1 of our coverage on Captain Marvel was one of the two studio visual effects supervisors, with Chris Townsend. She supervised the 2nd unit that was to shoot for many of the cat takes. "It often took a bit more time shooting Reggie, our hero cat, or any of the three other cats, and that was time that the main unit didn’t have,” she explained. "I once shot a bunch of chickens but this was a first shooting cats. They were really awesome to work with and so adorable.” Of the approximately 100 or so shots in the movie of Goose, about 70 of them are CG. Reference takes of the real cat(s) were shot for most of the computer generated cat shots. The reference was used to dial in the photorealism of the CG cat. Trixter, supervised by Dominik Zimmerle, did the majority of the CG cats, including the original asset. "I have to admit I’m totally a dog person but am a bit swayed towards cats after spending time with Reggie,” Croshaw jokingly adds. The main effect Croshaw supervised was the de-aging effect. As we wrote previously, this was accomplished by a team lead by VFX supervisor Trent Claus at Lola VFX, but there were also teams at Rising Sun Pictures lead by VFX supervisor Malte Sarnes and comp sup Guido Wolter. There was also a team at Screen Scene in Ireland led by VFX supervisor Ed Bruce. Lola has roughly 365 shots in the final film, all of the 50 Coulson shots and 315 Fury shots. Rising Sun Pictures did roughly 115 additional Fury shots and Screen Scene did roughly 30 more Fury composites. "It wasn’t easy to keep the continuity but all three did an amazing job. Our goal was always to have it feel so natural the audience doesn’t question it,” Croshaw recalls. Fury’s effect had to be seamless over the course of the entire film. "Sarah Cave was our in-house coordinator for Lola VFX, and she took an early cut of the film and meticulously screen grabbed a still for every shot that had Fury. The intention was not to grab just any still but a still that resonated his character for that shot.” Croshaw turned her office into walls of Fury pictures to make it easier for her to see all scenes at once and "also remind me of the big picture. It’s a bit old school but I find it’s easy to get lost in the minutia when everything is neat and tidy in a database,” she comments. Having the physical pictures in front of her all hours of the day constantly reminded Croshaw of the whole film the team had to finish. Rising Sun also did all of the forearm holograms throughout the film, the project Pegasus hangar CG environment, Quadjet exteriors and other effects from photon blasts to bluescreen composites. Train Chase with Marvel, Fury and Skroulson. 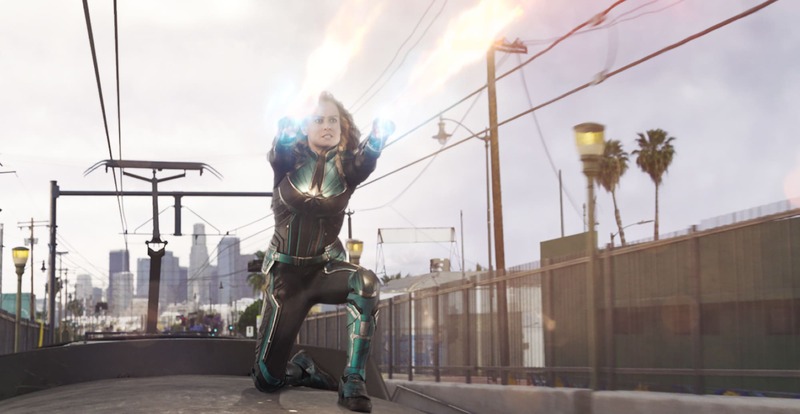 Luma’s biggest contribution to the film is the sequence nicknamed the “French Connection,” which depicts Carol Danvers fighting atop a moving LA Metro train against a Skrull who has taken the form of an unassuming Granny and who later shifts into a middle-aged man. Simultaneously, Nick Fury and Agent Coulson (or 'Skroulson') are racing through the streets below to keep up with the train by car. 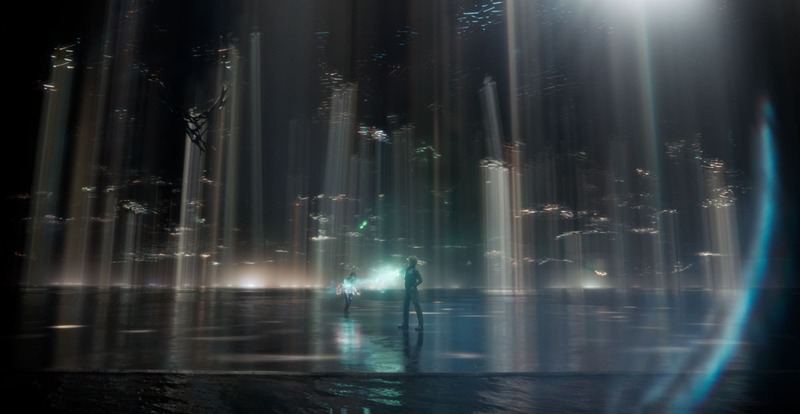 Luma VFX Supervisors Kevin Souls and Brendan Seals were tasked with keeping the sequence linear and successive. While the setting appears to be continuing down the tracks in a singular location in 1990s Los Angeles, the scene was actually shot in four different locations throughout the streets of L.A. The sequence travels through West L.A., East L.A., and eventually moves towards Downtown. The production had three metro cars to film on. 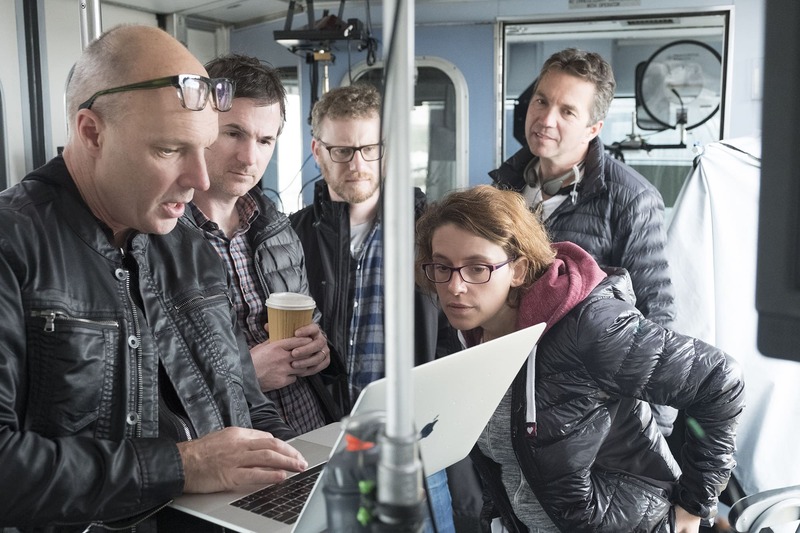 "We made the best of the situation and spent a few frantic days tech-vizing, trying to figure out how we would shoot in that limited space,” Croshaw explains. "With the neighbour building being only 3m or so away, we hung a blue screen on it.” Specific plates were shot for backgrounds at various LA Metro locations but the bulk of the backgrounds originated as array footage that Luma processed, stitched, and reconstructed as needed. The array vehicle for the train plates was called a high rail truck. "It was pretty cool in that it could drive on the tracks and on roads. We worked with Alex Carr at Cinemoves to build the rig. It was a 3x 8K Red Monstro with a 'Manual' Canon 12mm Lens in Portrait Position Mode,” Croshaw recalls. 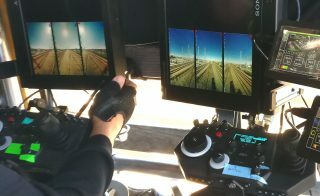 The 12mm Lens allowed the team to reach 170 degree FOV Horizontal, and 120 degree Vertical. The Array was mounted and balanced on a MoviXL stabilized head. The MoviXL attaches via standard Mitchell Mount. 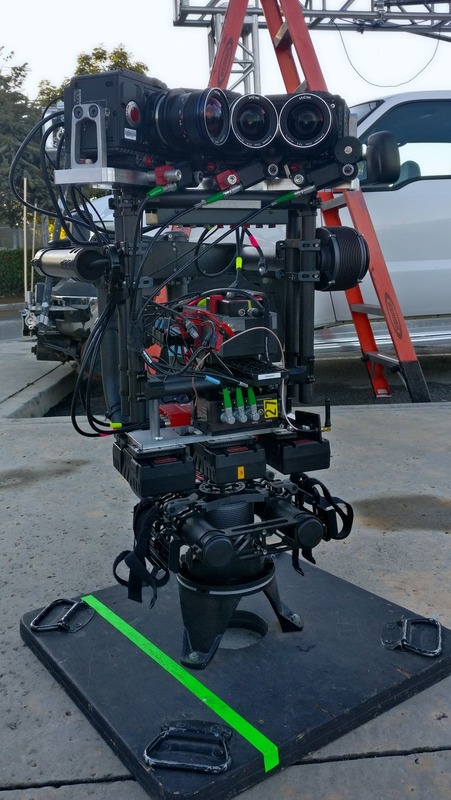 "This a quick and efficient way of moving a 3 Camera Array to various mounting points, saving setup time while shooting various plate shots,” she adds. The Array is controlled by a device called the UltiMote invented for multiple control of up to 4 cameras via ethernet. The first shoot day gathering the array footage was on a closed section of the metro track in a quiet part of the city. The fight then escalates to the top of the moving train. Given the inherent danger of filming this scene, all footage of the fight was captured with Larson and stunt actors with a bluescreen backdrop and a stationary train. 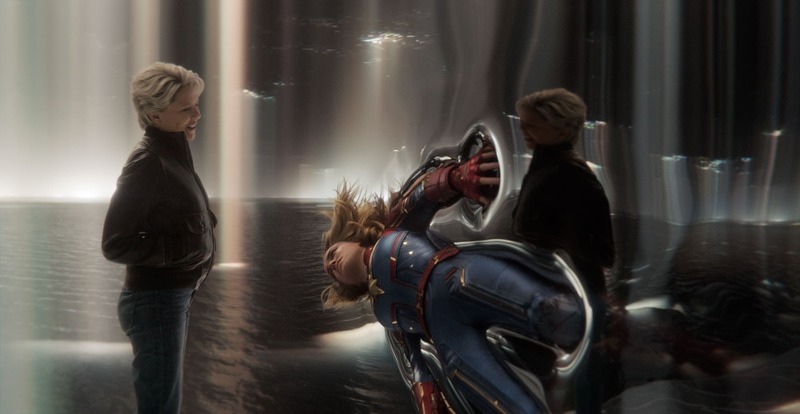 Luma’s visual effects team mixed both actions of the actors, and for more complex action shots, Luma created a completely digital version of Carol. 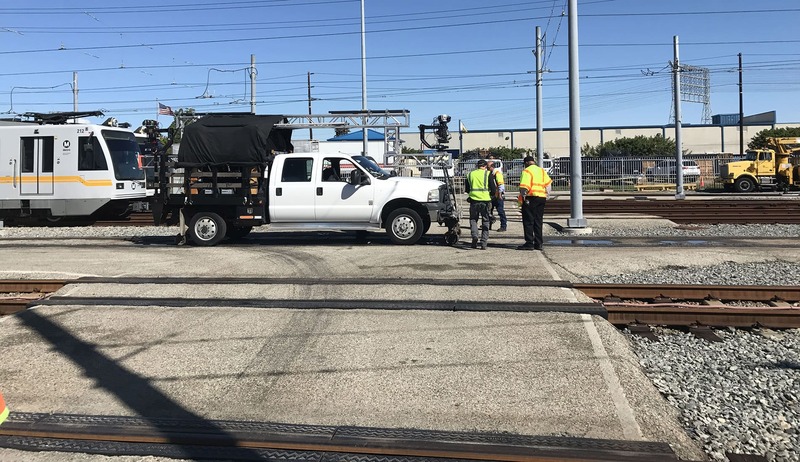 For safety reasons, the real-world camera was placed just above the train tracks, so the Luma team needed to refilm that scene from a higher angle to recreate the height of the train. “Every scene taking place on top of the train was either a 2D or 3D recreation,” recalled Brendan Seals. Digital Domain handled the Skrull transformations (see the video at the top of the story). The team was lead by Dave Hodgins, and were responsible for creating the Skrull transformation effect and the incredible canyon dog fight at the end of the film. Shannon Justison and Heather Flynn were the previs/postviz supervisors for the Third Floor and their team laid the foundation for the visuals. "Scanline’s awesome effects were the aerial chase and crash landing and also when Carol absorbs the energy at the crash site. They were led by Nick Crew,” comments Croshaw. Rise and supervisor Oliver Schulz created the Hala exterior worlds. Christian Kaestner and his team at Framestore made the moody Torfa sequence and battle. Cantina Creative, supervised by Carly Cerquone, did the graphics. "Elastic did those awesome MOE’s that will have Hole’s song Celebrity Skin stuck in your head for days,” Croshaw finishes by saying.